Imagine Cthulhu. Go ahead. Get him in your mind, in all his non-Euclidean, tentacled, horrific glory. Dripping with black sea water as he rises from the crushing, unknown depths of the ocean. Red eyes sleepy yet ready to survey the land and all those on it who he will devour. Probably making a noise somewhere in between that of a T-Rex and whale. Got that image in your mind? Squishables, purveyors of all things big and fuzzy, also did some thinking on the gruesome visage of the most feared Elder God. After the jump, look into the face of the baddest bad to ever bad. In his house at R'lyeh, Cthulhu waits to be snuggled. Dear readers, I will not tell anyone if you let out a squee of absolute terror as you look upon this horrifically adorable face! I do not blame you, since this is the most goddamn cute thing I have seen all month. Squishables is a little company that makes giant (15 inches!) balls of cuddly happiness in the shape of friendly animals. Do you want to squish and smoosh and hug a giant plush octopus, platypus or cow? Then Squishables is the place for you. They have recently released the giant huggable Cthulhu and I am in love. For $42 of your hard earned monies (because why else did we grow up and get grown up jobs if not to buy giant stuffed animals with our grown up money? 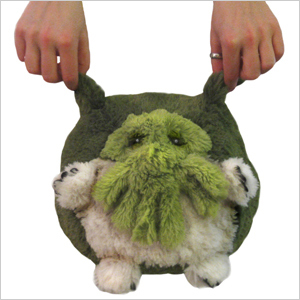 ), big squishy Cthulhu can be yours. 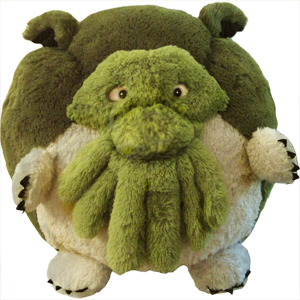 If huge Elder Gods aren't your thing, may I also suggest the adorable MINI squishable Cthulhu that is only a terrifyingly adorable seven inches tall? Maybe we can pitch in and order a big one for Cthulhu himself. Maybe an adorable stuffed animal will make him sleep just a little bit longer. How could anyone not sleep soundly with their arms (or tentacles) wrapped around such a fuzzy little thing?